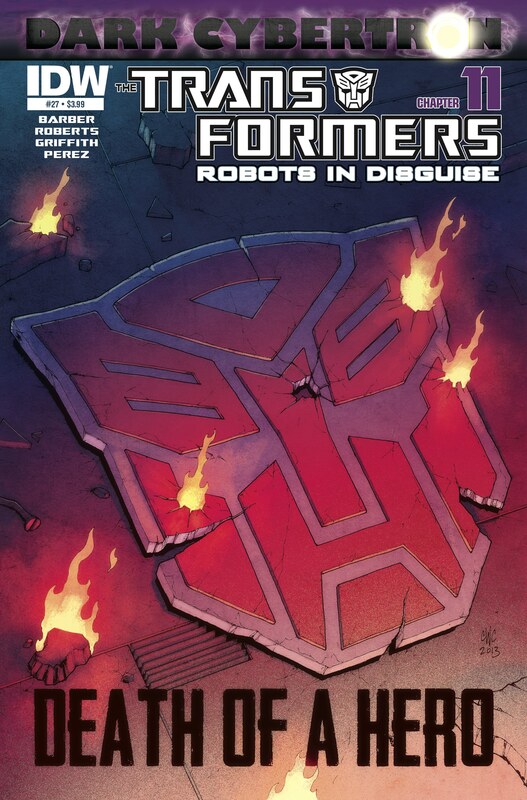 Transformers: Robots in Disguise: Dark Cybertron: Death of a Hero: Is It Over Yet? If I went back in time 20 years to tell my young self that in the future Transformers comics would still be around and that my young self’s favorite character Shockwave would be conquering the entire universe with mad science in in a multiple ongoing Transformers comic book Event, well little me would be very excited. But then I would have to break it to myself that this Event is rather dull and making me tired of Shockwave. Little me would just stare at future me in confusion. This is Dark Cybertron. There have been side mini series and big storylines that have introduced new characters and concepts to Transformers in the past. 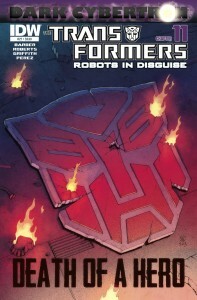 But this is the first real all caps EVENT COMIC for Transformers comics. And that’s where everything kind of goes wrong. But I get ahead of myself. RiD #27 opens with the basic Event recap page that’s better than the last one which mentioned a “so-called Death-Plague” being cured that I never noticed was happening outside of some black paint on Starscream. This recap was all about Shockwave being all “SCIENCE!”, Megatron & Bumblebee becoming bros, and scrap hitting the turbofan. Anywho, Brainstorm is dead because of static electricity, Jhiaxus gets a brand new toyetic body, rock-em sock-em combiners, and umpty billion Ammonite Mini-cons (in stores now) are swarming over and around Cybertron blotting out the sky. Plus Shockwave’s master plan is to collapse the entire universe (except Cybertron) down into a singularity to power Cybertron for eternity yet somehow time will have no meaning anymore. I’m not sure when everything in Transformers became a secret machination of Shockwave’s master plan but somewhere along the line this “Shockwave did it” trend snowballed into infinite improbablility. He planted crystals in some random planets millions of years ago that spring up into ores with easily named magical power categories. Yeah he ment to do that. He knew he would be able to mine Life and Death… How? Maybe Shockwaved hacked the Minecraft server he’s running on. In some ways the whole Dark Cybertron has been like a Transformers Greatest Hits album. Shockwave’s plans. Bringing back the Dead Universe. Megatron threatening Galvatron. Optimus Prime being all self-sacrificy. Noble speechifying. Characters dying not long after getting a new body/toy. The universe hating Waspinator. Yet some how all the disparate elements don’t gel into a cohesive whole. Really the only good thing to come out of this whole mess is the new female Autobots… Lady Transformers? Womanly robots? Gynoid Cybertronians? Fembots? What is the proper gendered term for giant genderless robots who look vaguely more like human women than they do human men? *shrug* Whatever. Windblade, Chromia and Nautica are a bright spot in this murky grey plot. Well them and the regular artists Alex Milne and Andrew Griffith coming back to the books. Taken as a whole Dark Cybertron has been a disappointing Event. It’s derailed the storylines going on in two books to throw everything into a confused pile. But I am hopeful for what comes after the Event is over. A new ongoing series for Wingblade with beautiful preview art. The greatest war criminal of all, Megatron becoming an Autobot? And just the general resumption of robot adventures in space. Great, now I want to make a Shockwave skin for Minecraft, and tell people everything I’m building is part of the Master Plan.